TUCSON, Ariz — One of five men charged in the murder of Border Patrol Agent Brian Terry told a FBI agent he was in the area where Agent Terry was killed, and was carrying an AK-47 assault rifle at the time. Heraclio Osorio-Arellanes is accused of being one of five men in a “rip crew”, bandits who wait in drug smuggling zones to intercept and steal drug loads. Agent Terry was part of an elite team of agents trying to intercept and arrest the rip crews. In December 2010 Terry’s unit got into a firefight with a group of bandits in a remote area near Rio Rico. Terry was shot and killed. One of the bandits was wounded. 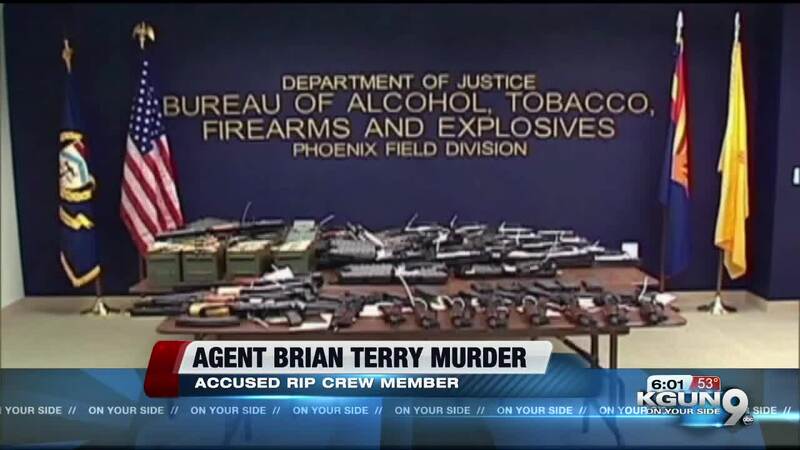 It came out later that some of the bandits weapons were involved in Operation Fast and Furious, an effort by the US Bureau of Alcohol Tobacco and Firearms to allow illegal gun purchases with the idea of tracing the guns back to drug cartels. The agency lost track of thousands of guns. Heraclio Osorio-Arellanes, was being held on charges in the case when a FBI agent station in Mexico questioned him in a Mexico City prison. The agent says Osorio-Arellanes said he was in their area of the shooting because he had smuggled drugs through that area and had intercepted and stolen several drugs loads there. Testimony about the interview did not detail the shootout but did recount the man telling the FBI he ran from the shooting scene and dropped his AK-47 about two or three hundred meters. Shortly after testimony about the prison interview the prosecution rested its case. The defense rested without presenting any witnesses. Closing arguments are set for 9:30 tomorrow. Three other members of the rip crew are already in prison. Two are serving life in prison. One is serving a 30 year sentence. At last report one remaining suspect is under arrest in Mexico and awaiting extradition.